To examine the effect of a sequential fatigue protocol on lower extremity biomechanics during a crossover cutting task in female soccer players. Eighteen female collegiate soccer players alternated between a fatigue protocol and two consecutive unanticipated crossover trials until fatigue was reached. Lower extremity biomechanics were evaluated during the crossover using a 3D motion capture system and two force plates. Repeated-measures ANOVAs analysed differences between three sequential stages of fatigue (pre, 50, 100 %) for each dependent variable (α = 0.05). Knee flexion angles at initial contact (IC) for pre (−32 ± 9°) and 50 % (−29 ± 11°) were significantly higher than at 100 % fatigue (−22 ± 9°) (p < 0.001 and p = 0.015, respectively). Knee adduction angles at IC for pre (9 ± 5°) and 50 % (8 ± 4°) were significantly higher (p = 0.006 and p = 0.049, respectively) than at 100 % fatigue (6 ± 4°). 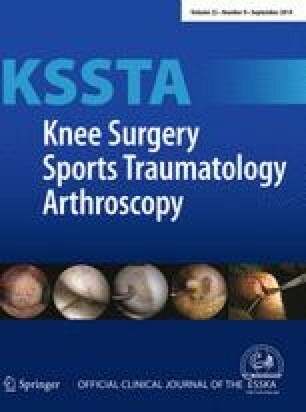 Fatigue altered sagittal and frontal knee kinematics after 50 % fatigue whereupon participants had diminished knee control at initial contact. Interventions should attempt to reduce the negative effects of fatigue on lower extremity biomechanics by promoting appropriate frontal plane alignment and increased knee flexion during fatigue status. The authors gratefully acknowledge the research support from National Institute of Health (1R03AR054031-01, 1R01AR062578-01) and the Portuguese Foundation for Science and Technology (SFRH/BD/28046/2006).